This comprehensive 9-hour tour from Lisbon gives you the chance to visit one of Europe’s most beautiful romantic palaces. Avoid the stress of making your own way to the evenly dispersed highlights of Sintra and Cascais by travelling around the province with ease. Marvel at the UNESCO-listed Pena National Palace; visit Cabo da Roca, Europe’s westernmost point; and discover the charming fishing village of Cascais. Hotel pickup and drop-off are included. Your tour begins with hotel pickup in Lisbon. After boarding your air-conditioned minivan, you’ll receive a historical overview of Sintra and its regal heritage. Stop first at the Palace of Queluz — the official summer residence of the Portuguese royal family­ — and spend 45 minutes admiring its stunning architecture. Next, follow a serpentine slope to Pena National Palace, a UNESCO-listed structure perched on the peak of Sintra mountain. Spend 1.5 hours discovering the colorful confection of towers and turrets, considered one of Europe’s most beautiful Romantic palaces. 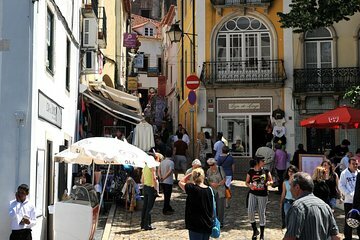 Descend to Sintra village to observe the charming streets of its UNESCO-listed center. Here, you’ll have 2.5 hours of free time to absorb Sintra’s enchanting ambience and purchase lunch from a recommended restaurant. At a prearranged meeting point, reconvene with your guide and proceed to Cabo da Roca, Europe’s westernmost point. From here, you’ll absorb spectacular views of the Atlantic coast and its crashing waves. After ample time for photographs, continue to Cascais to spend time strolling its beaches and admiring elegant buildings. Before drop-off at your Lisbon hotel, you'll stop at the luscious Gardens of the Casino of Estoril — one of Europe's largest casinos. Me and my sister enjoyed this tour.Efficient way to see Sintra and Cascais.Alex was a great tour guide.He provides good advice on the attractions and food to eat.He made the tour interesting and fun Would recommend tour. Alex was a most accommodating and entertaining tour guide . Unfortunately I had recently broken my knee so I had to use crutches on our trip but this didn’t stop Alex from making the tour wonderful! He made sure a wheelchair was ready for me and was so helpful in making me walk as little as possible . We had 3 different languages in our group and we never felt left out of the conversation. We learned a lot and laughed too ! We will definitely book with this tour again ! We were picked up at our hotel which was very convenient, but the van could have been nicer. We had become spoiled by new model Mercedes vans with plenty of room on our previous tours. That said, our tour guide was wonderful and we had a full day first visiting the National Palace Queluz and then on to Cascais (an upscale resort town), Sintra (where we had time for a lovely lunch and a little shopping) and then The Pena Palace to visit the Disney like castle. This was a very full day full of fascinating sites with a great tour guide. Excellent palaces and castles. While in Sintra, don't forget to ask your guide about Quinta Da Regaleira. Our driver/ tour guide didn't have a mic on the van and was a challenge hearing and understanding him because of audio issues. He was knowledgeable but a little grumpy. As always Viator is a reliable and expert tour operator. They are always on time, and they always do what they promise. The tour to Sintra was fantastic, I recommend it.. The tour did not include the tickets to visit the Queluz Palace and Da Pena Palace in their interiors, but you can get tickets for 25 euros including both palaces and the transfer from where the tourist bus left to Da Pena Palace because the road distance is long and steep. Both palaces are a wonder to admire and walk aroun. Do not stop doing it !! 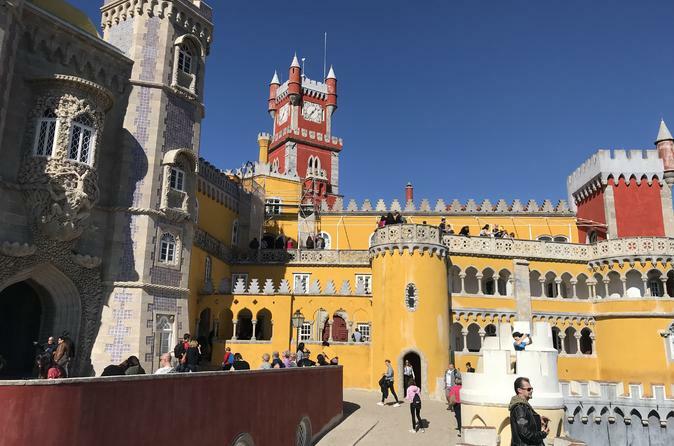 The tour also include free time in Sintra downtown where you can walk the small village, lunch in a lot of different restaurants, visit the National Palace in the center and take a quick look to the the Quinta da Regaleira. After Sintra, the tour visit Cascais giving you some free time to walk around the spa town and Estoril. I think the tour is excellent and I recommend it if you want to know and enjoy Sintra. It was an extremely well organised small group tour by our guide Joaquim. He is very informative, punctual and funny we even discussed about Portuguese food habits and other random topics along with the history. His recommendation was just spot on for foodies like me. We had even extra stop at Queluz palace along with Sintra and Cascais. I strongly recommend him.